STE-THERESE, Que. – Kenworth’s Paccar factory in Ste-Therese, Que. 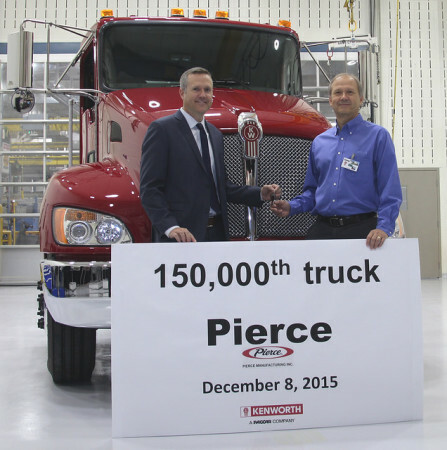 recently produced its 150,000th truck, a Kenworth T370, made for long-time customer Pierce Manufacturing. The truck is equipped with a Paccar PX-9 engine with 350 horsepower, 1,000 pounds/foot of torque at 1,400 rpms, a five-speed Allison 3000 EVS automatic transmission with PTO provisions, full National Fire Protection Association compliance components and a 14,000-pound front axle and 26,000-pound rear axle with a rear axle ratio of 5.25. The vehicle will also be upfitted by Pierce, which manufactures custom fire apparatuses, with a fire tanker/pumper body. Skoog presented a special commemorative plaque and the keys for the 150,000th truck to roll off the Ste-Therese assembly line to Rich Demski, Florida division chief engineer and commercial chassis manager for Pierce. Jason Skoog, Kenworth assistant general manager for sales and marketing, (left), presents the keys to the 150,000th truck built at the PACCAR-Ste.-Therese plant – a new Kenworth T370 – to Rich Demski, Florida division chief engineer and commercial chassis manager for Pierce Manufacturing.